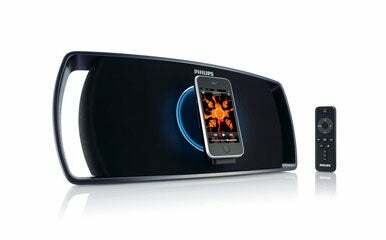 Several new iPod accessories announced by Philips this week put a new spin on the traditional iPod dock. The SBD8100 is actually a speaker system, though one with a dock. It has a large base, and a very Bose-like vibe. What sets the SBD8100 apart is its remote-controlled motorized dock, which turns the iPod from vertical to horizontal orientation. This may seem insignificant, but with the iPod touch and iPhone, it means that you can watch videos in landscape mode with stereo sound. You can also use the Cover Flow feature to browse your music library while listening, all while maintaining the same profile. Philips’ SBD7000 is much like the 8100, but without the motorized functionality. You turn the dock manually, and the speakers adapt accordingly. Most of all, the SBD7000 is shielded from cell phone interference. The SBD8100 will cost $149.00, and will be available in June 2009; the SBD7000 is due in March, priced at $119.